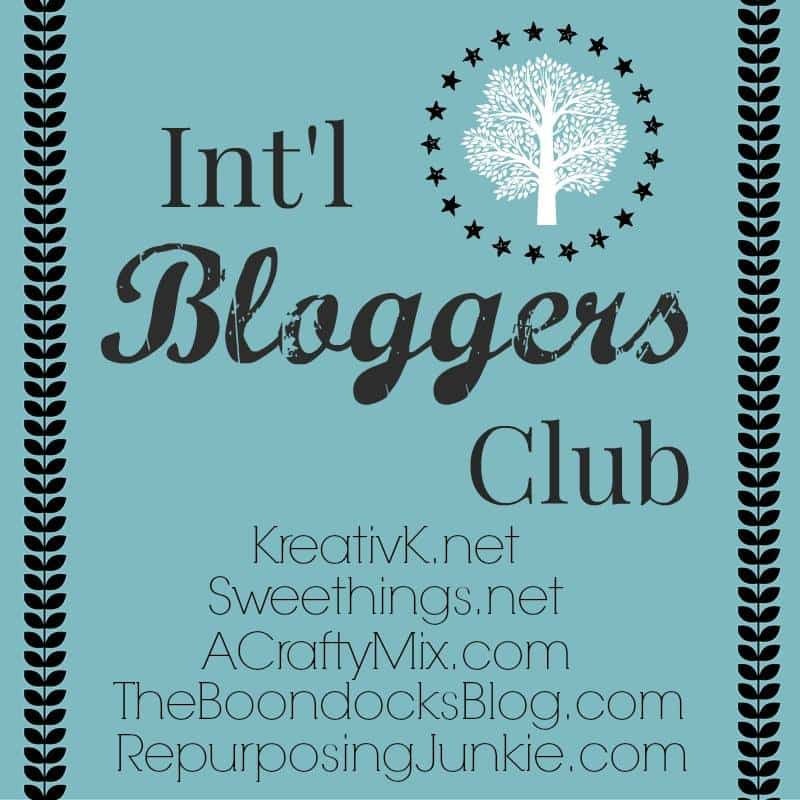 Welcome to another series of our Int’l Bloggers Club Challenge! It’s amazing we are ending another month, it seems it was yesterday when we were sharing our post about the things that still challenge us, and I used my jigsaw to make this farmhouse name sign. 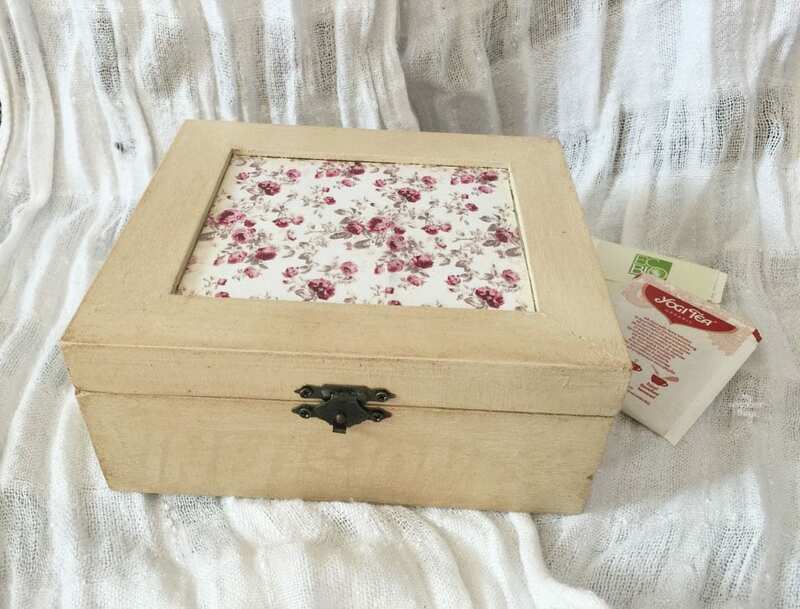 If you are new to the blog let me explain what is this challenge about: I teamed up with four talented ladies around the world to show our DIY or traditions, and this month we decided our theme would be fabric. Due to my love/hate relationship with my sewing machine and my limited sewing skills, when I think about fabric is normally because I want to use it for my furniture. 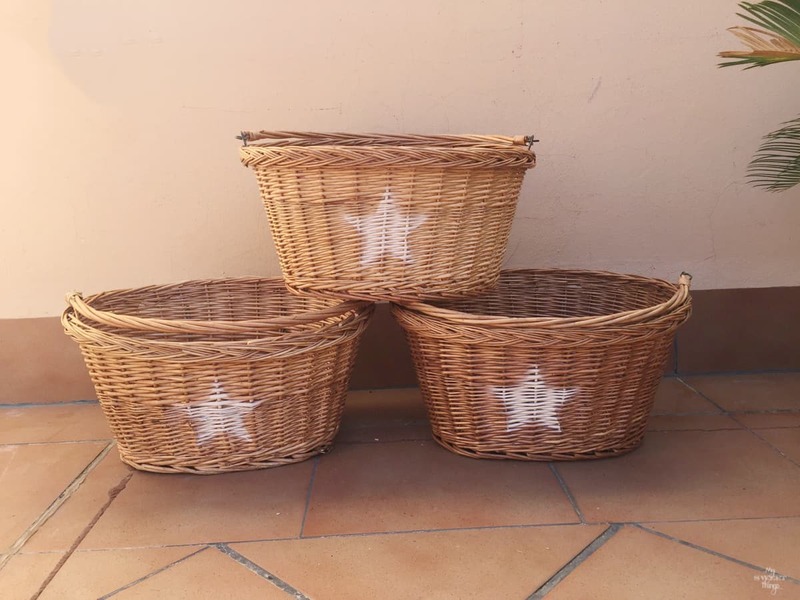 An old Elizabethan chair was transformed with black fabric, a tote bag was perfect for a grain sack style footstool, and a fabric transfer on a plain white fabric turned a simple stool into a French style one. 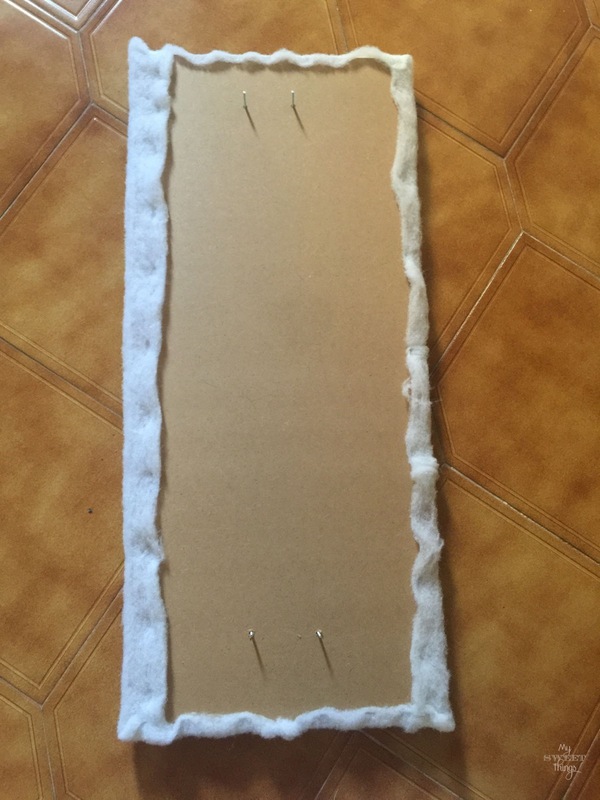 By now, I guess you can imagine this time I am not going to show you anything I sewed but another upholstered piece of furniture. 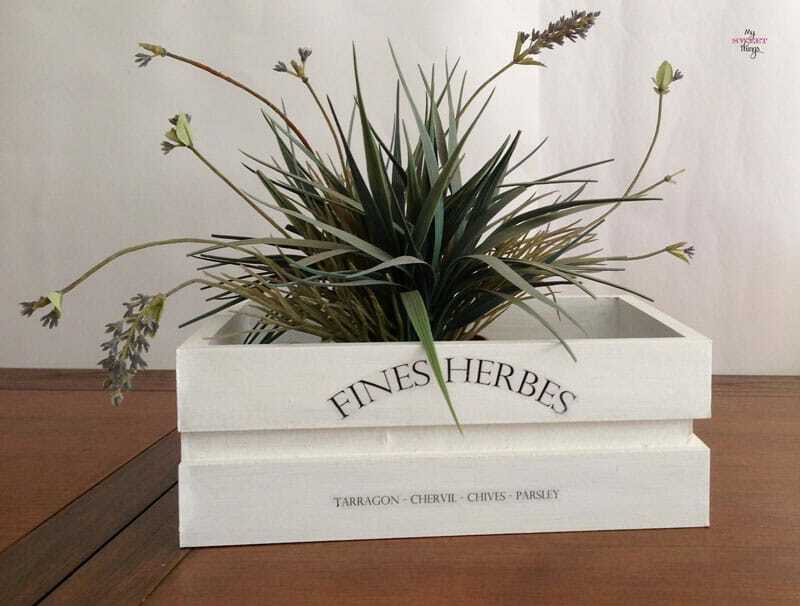 In fact, I did it some time ago for a room makeover a client requested. You will find affiliate links for your convenience, you can check the full disclosure here. 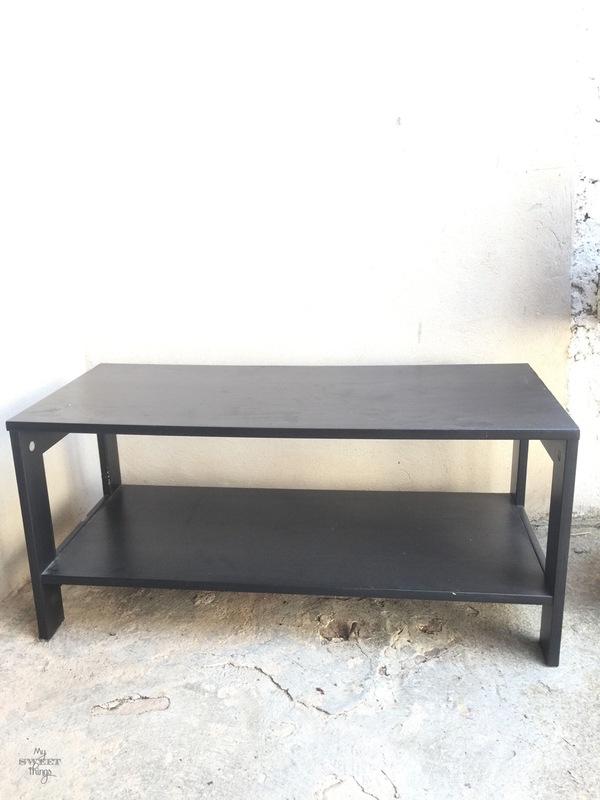 I had this old little coffee table from Ikea. I think a dog thought it was its toy and chewed it. 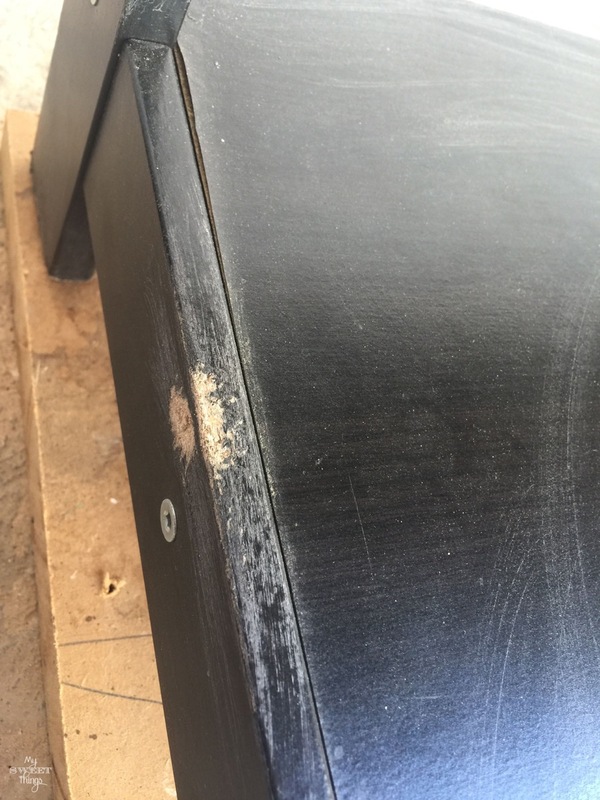 First I used some wood filler to fix it, and then some glue to fix the spots where the wood was peeling. 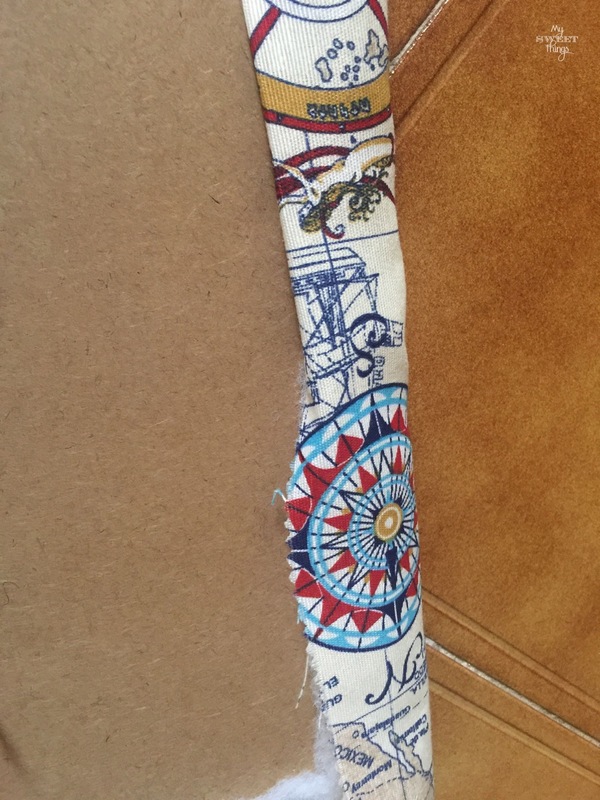 I had a beautiful nautical piece of fabric my friend my El Antiguo Bazar had sent me a couple years ago and I was waiting for the perfect time to use it. 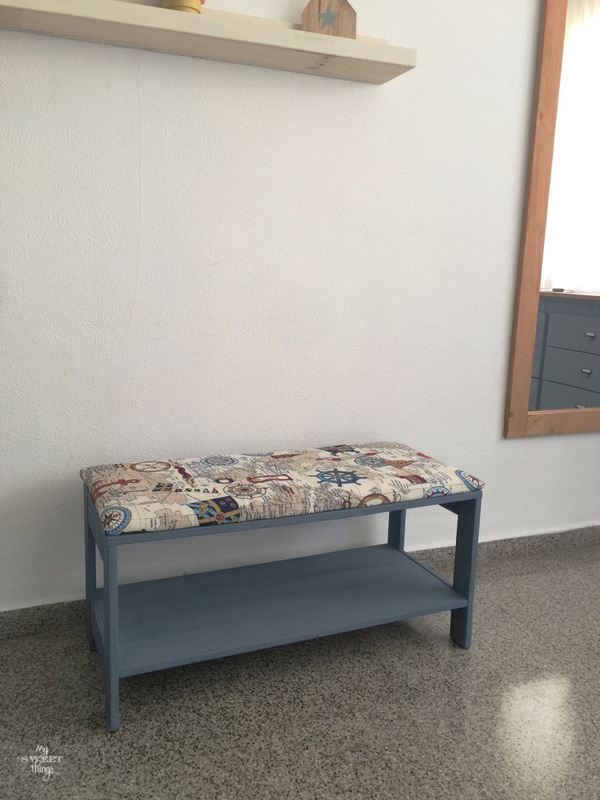 As it had blues on it I was sure the perfect color for the bench would be “Soldier Blue” from Old Fashioned Milk Paint. I love this paint not only because it’s a green paint with no VOC, but also because once the piece is painted, it seems it changes color depending on the light. 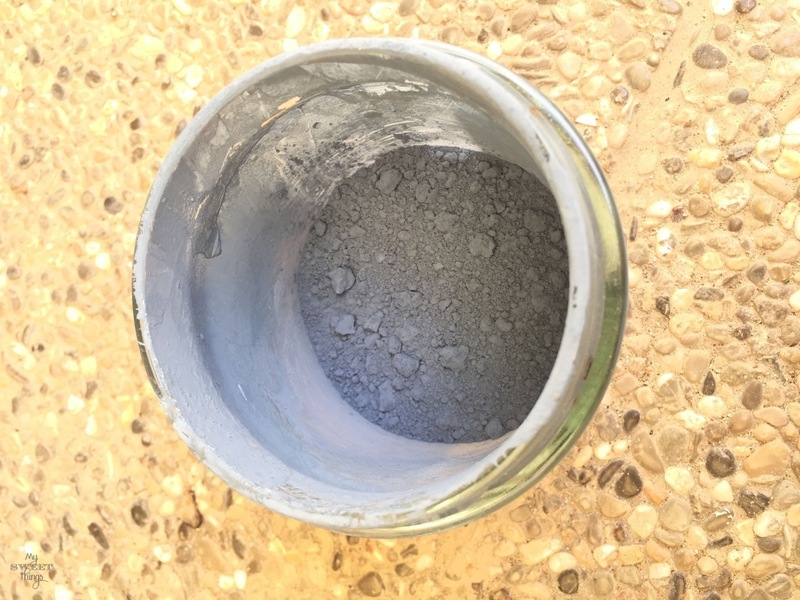 It comes in powder, and to prepare it you just mix the same amount of powder as of water and stir well. Then I added Extra Bond because I didn’t want it to chip. 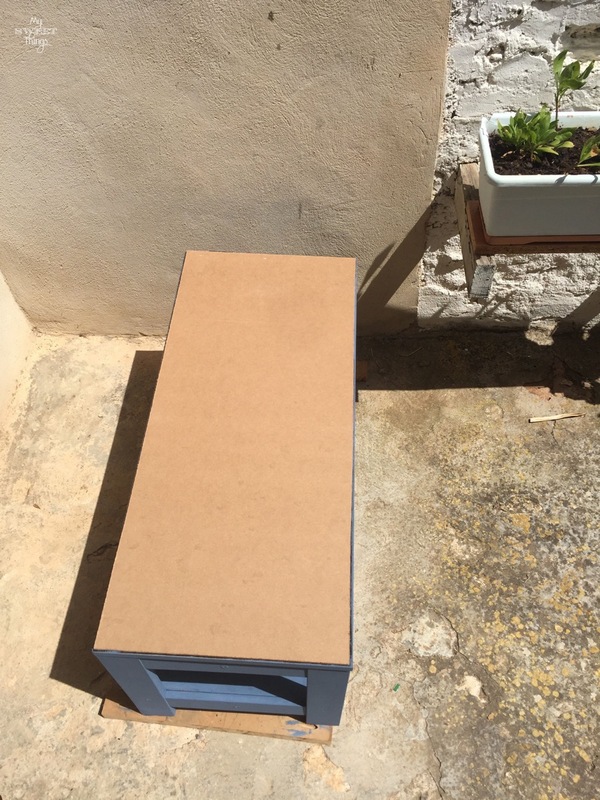 I gave it two coats, and then I measured a piece of wood for the top. After I cut it, I double checked it had the correct size. I drilled four holes and added four nuts, you’ll see why after. With the nuts on place, I added foam and batting. And the fun begun! Time to staple! I did the same with the fabric, folding the sides. It was done in a blink of eyes. Look at that fabric, isn’t it pretty? Here it is the upholstered nautical bench coffee table in its new home. The room was a bit dark so the pictures doesn’t reflect the beautiful blue color, but it is stunning. Another shot of it, I am thinking of making one for me too. 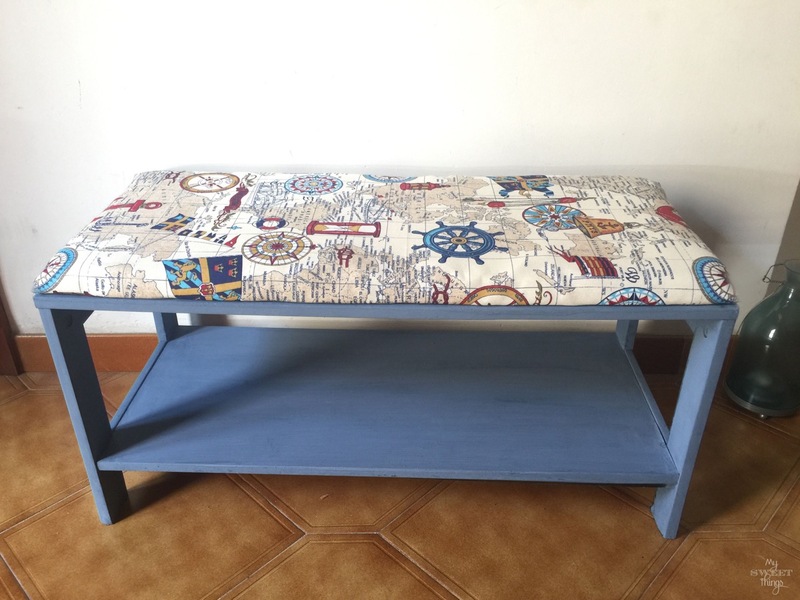 What do you think about this nautical upholstered bench coffee table? Do you like it as much as I do? 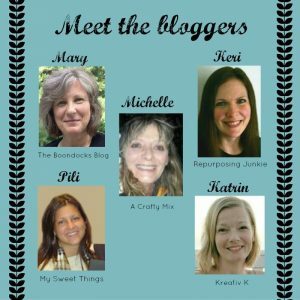 Don’t forget to stop by to see what my friends have came up with this month. 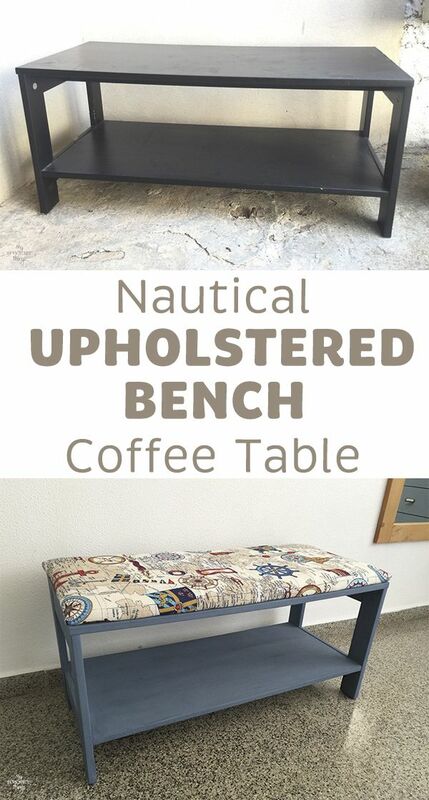 This entry was posted in Before & After and tagged Before & After, Bench, Coffee Table, Decor, DIY, Fabric, Furniture, home decor, Milk Paint, Nautical, Paint, wood. Pili I can’t believe it’s the same piece of furniture! What a huge difference. 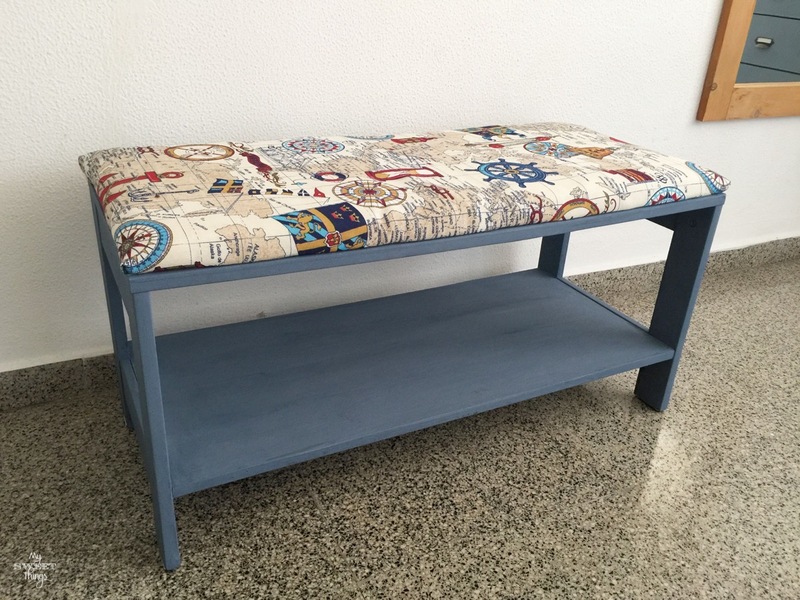 You turned it into such a beautiful bench, the color is gorgeous and goes so well with the nautical fabric. Well done!! This came out fantastic. It is so stylish and functional. 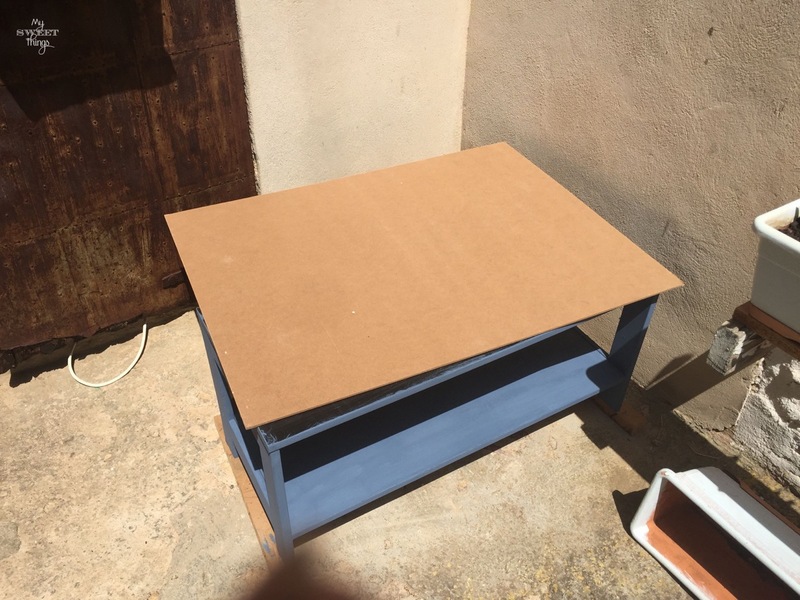 What a great save for your dog chewed coffee table, Pili! Love the new paint color and the pretty colors in the nautical fabric. Doesn’t look like the same piece of furniture! 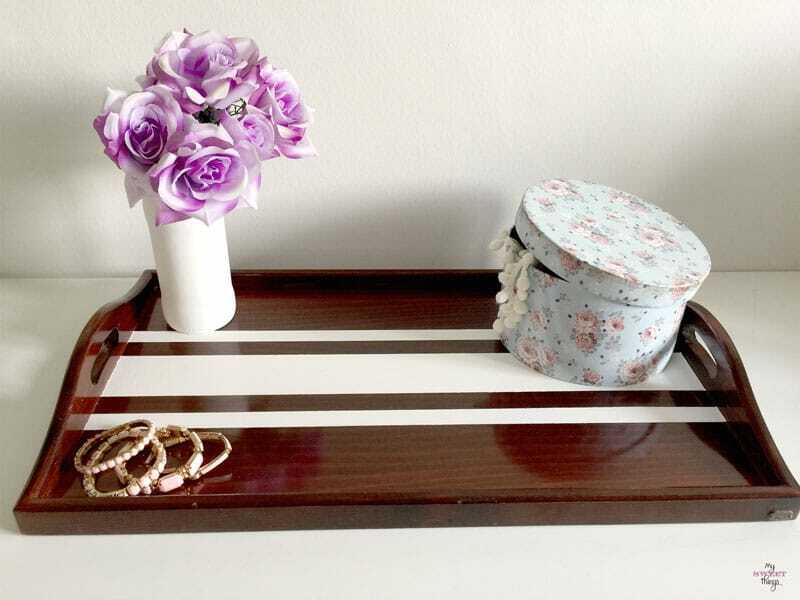 Pili you have done a fantastic job with this old Ikea table. First of all that color is wow! 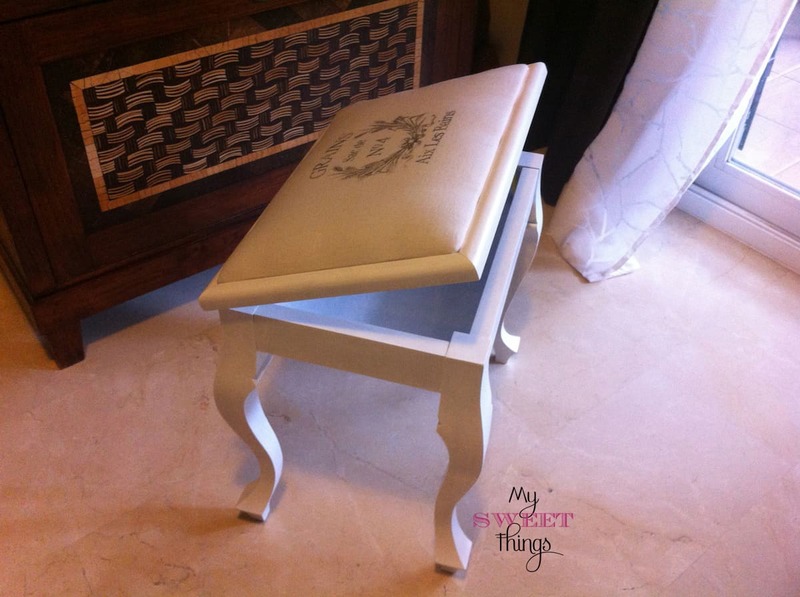 I have used it before and know what you are talking about, there is so much depth to milk paint. And your fabric ties in perfectly to create a nautical look that must fit in perfectly in this home. I’m a huge fan of projects utilizing maps or map print fabric. Great find on that map fabric. Perfect for this project! Pili, the bench is beautiful! I love that color and the pretty nautical fabric! Ok. Sorry, but I don’t “see why” the nuts were added. Can someone tell me what was done with them? 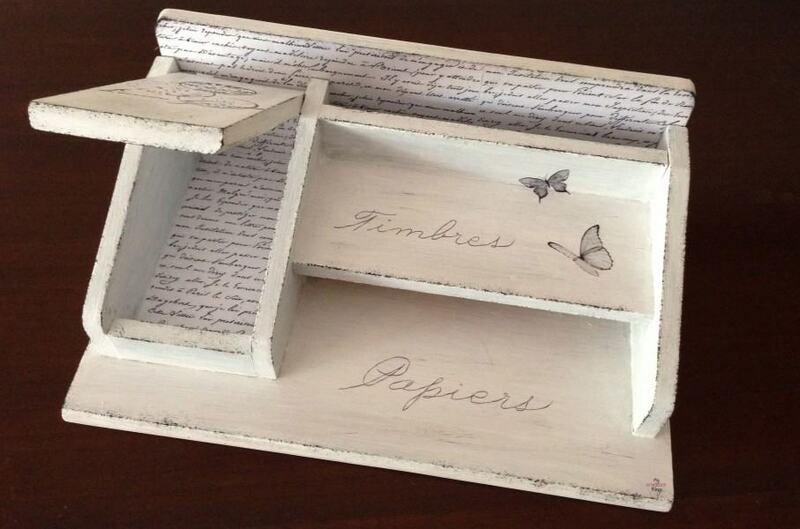 This is really cute and I would love to do the same with a coffee table I acquired for $7. You are right, I didn’t explain the last step with the nuts. 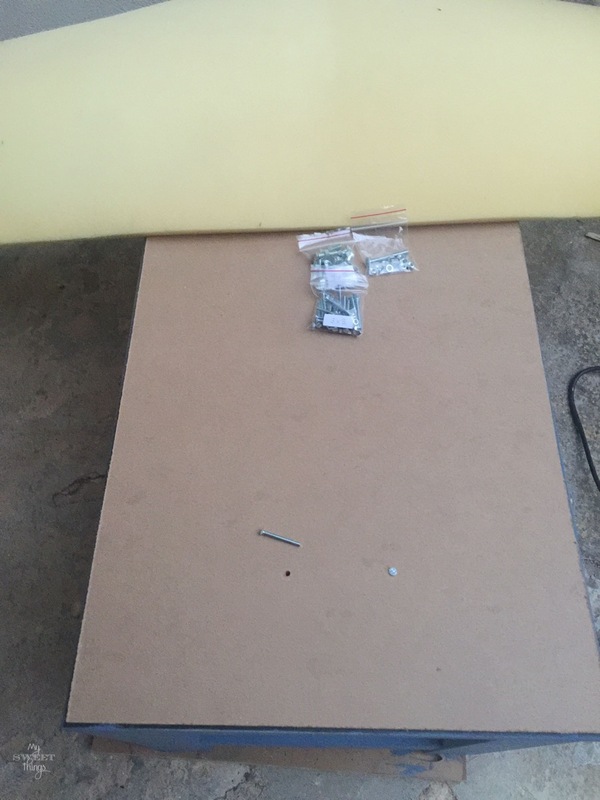 As you see in the picture, when I say I drilled four holes, I mean I drilled them deep enough to perforate both the plywood and the table top. 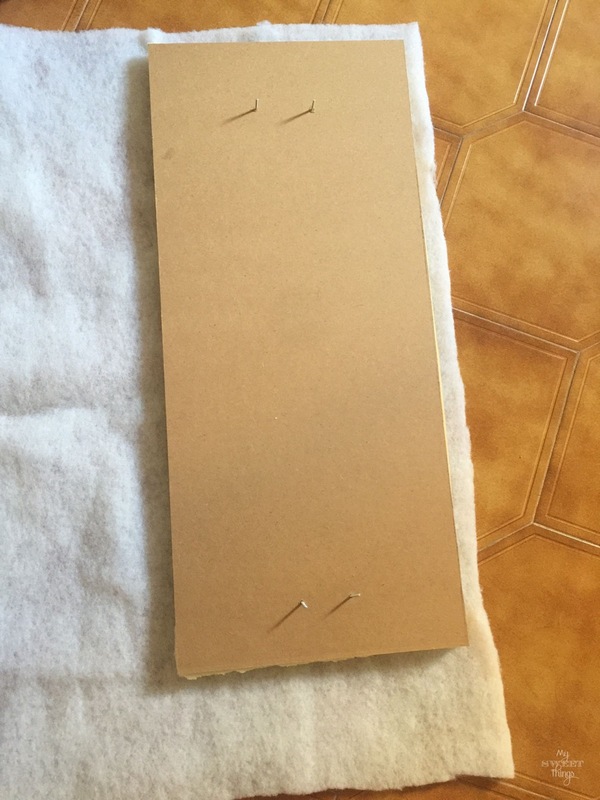 This way, once the plywood was covered with foam and batting and the nuts were stuck there, they went through the holes of the table top and kept everything in place. Now you can move the bench or even flip it and it’s one piece, nothing falls.